Figuring out how to efficiently heat your home is a tough task, and it’s made even harder as we transition to colder weather and tinker with the best way to adjust the heating schedule. Because of the way heating works, you aren’t afforded the freedom to customize your heating pattern the way you want – or are you? As it turns out, your options aren’t as limited as they might seem: divvying up your heating arrangement is possible through the use of zoned air systems! These are a wise, affordable investment that offer the freedom and customization choices that can help you efficiently heat your home without spiking your energy bills. Freedom Air and Heat can tell you how! What is a Zoned Air System? First things first – it’s important to understand how a zoned air system works. Thankfully, they are pretty self-explanatory. The system divides your home into zones, each of which is controlled by a different thermostat. As a result, when you adjust a thermostat, you’ll only see a change in temperature in the zone it’s responsible for. 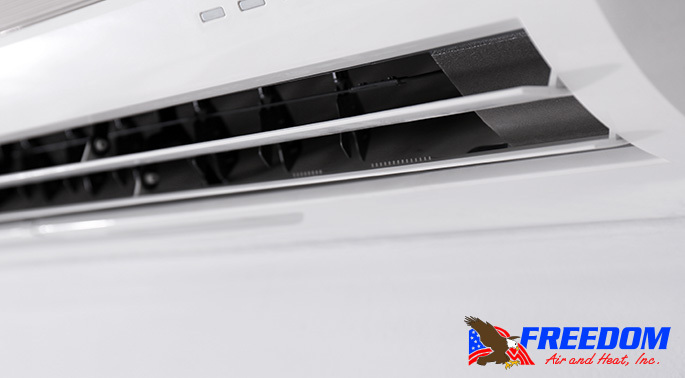 Unfortunately, installing one isn’t something you can do yourself, but a professionally trained technician – like one from Freedom Air and Heat – can handle the entire process from start to finish. By this, we mean that a zoned air system can help counteract the natural conditions that might affect your home. For example, if you have a large window that sits directly in the sun all day, then that room is going to naturally heat up and might not need as much central heating (as other rooms). However, with a traditional heating system, you’d end up funneling even more hot air into that room just so you can enjoy warmer air in another, colder part of the house. Thankfully, a zoned air system gives you the ability to cut off the heat to that room while still warming up another one! What if you’ve got a guest room that doesn’t see a lot of use. We’ll be honest, even some of our guest rooms double as storage areas sometimes and they don’t get a lot of usage, so why should you need to heat up that room if nobody’s in it? With a zoned air system, you don’t have to. Simply leave that area alone, and you won’t waste money heating a place that rarely sees the light of day. The bottom line here should be obvious. A zoned air system helps you dictate which parts of the house you want to control with a thermostat, saving you precious money that would’ve been spent heating another part of the home. If one person likes their room colder while another wants the heat cranked all the way up, then that’s not a problem! What about heat that travels upstairs naturally? A regular heating unit saddles you with the cost of heating the colder downstairs area – plus a lot of pointless heating upstairs as well. We’ll have you and your family ready to enjoy your newfound heating customization in no time! Give one of our team members a call, and we’ll help begin the process of a cheaper energy bill and a warmer home. Reach us at 321-631-6886 today!